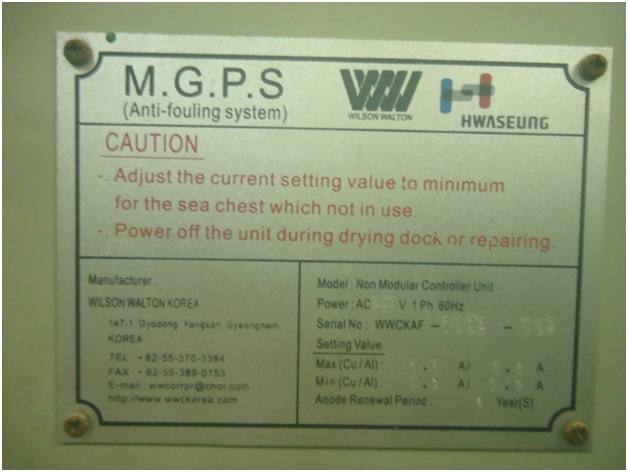 Marine fouling commonly occurs in sea water circulation systems. This involves the establishment of marine plants & animals, bacterial growths. These fouling organisms enter the system in microscopic and macroscopic form ex larvae and spats, settle and develop into adult forms wherever favorable conditions exist. Hard fouling by mussels, barnacles etc most commonly in seawater circuits and can result in interference in flow conditions, blockage. Traditional chemical methods (like chlorination) of water treatment are now less favoured because chlorine accelerates corrosion attack by causing pitting attack on steel, Is environmentally unacceptable and treatment requires continuos monitoring & control. New system : Direct current when applied to the copper anodes releases a controlled quantity of copper ions into the system to create an environment in which primary forms of marine life do not grow. Current applied to the alu anodes releases al-OH which reduce corrosion rates on ferrous components in SW system by film deposition. Mussels are not killed by the system. The environment it creates prevents them from settling or developing. It is Automatic, require minimal maintenance and is environmentally friendly. Power control unit – it is having AC input & DC output. Operational range for output voltage is 0v-12v DC. It should be located as near as possible to A.C. power supply and anode locations (to minimize the DC cable length & voltage drop)The system supplies four/six anodes. It can be provided with Air cooling fan & An input power supply failure alarm. Junction Boxes – this facilitates separation of anodes from the supply while carrying out inspection or anode replacement. Anodes are installed in mainly sea chests. Anode replacement procedure – power to the anodes must be switched off. Sea chest to be completely sealed off to prevent ingress of water. In case the valve of the sea chest inlet was closed, the output current is decreased to 0~50% amp. A weekly recording of current outputs on each anode is recommended and entered in log sheet. This provides a record of the systems operation.